A poem is not only a rhythmic composition of metrical lines but a collection of varied emotions stringed together. Thus it is through poems one can expect to pour one’s heart out and extricate every feeling. Here are some beautiful collections of best Easter poems which are bound to touch the special chords of several hearts. So share this feeling of Easter happiness with your loved ones and spread joy and bliss everywhere. Make sure you forward these poems to your loved ones as well, in order to make them feel special on this auspicious occasion of Easter! "Poetry is language at its most distilled and most powerful"
Poetry is the most powerful language. It is human language at its best. It has the power to move, the power to transcend all boundaries, the power to express the depth of feelings of ones heart - be it of joy, of sorrow or of any other passion that mankind has ever experienced since its inception. Poems are a great way to celebrate any occasion, and Easter is no exception. This Easter, TheHolidaySpot brings to you a collection of fantastic Easter poems, poems that range from the simple and funny to the sombre and spiritual. Go over our splendid Easter poems and gear up for the oncoming festivities. If you like to share these with your friends and loved ones, please click here to refer this page to them. Enjoy a happy Easter with our pretty little collection of Easter poems. May the Holy Jesus bless you and your loved ones! On Can-kicking(by Kyle Mitchell.) Go through this two lined Easter themed poem and start hiding your own Easter eggs. The White Day In Happy Purple(by John E WordSlinger.) Find out the truest essence of Easter through this “ever real, bonny story”. The Bunny Tale (by Del "Abe" Jone) Go through this beautiful poem and awaken yourself with a new hope and belief that you can yourself heal the ways of the world with your own individualised will. Easter comes but once a year Celebrate Easter with this beautiful Easter poem and get to know the truest emotions involved in the celebration of this festival. Easter Holiday Enlighten yourself with every minute details involved with the celebration of Easter as this poem is packed with emotions which are unique to the celebration of Easter! 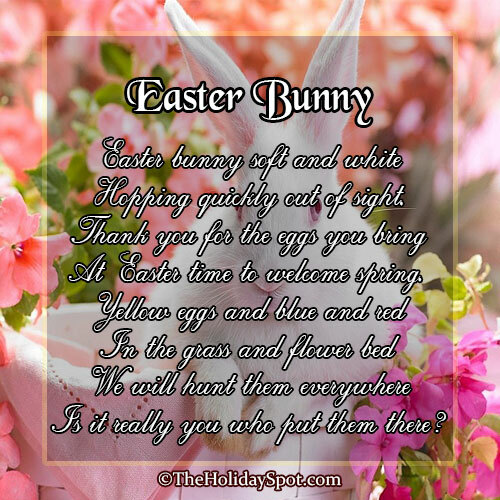 Easter Bunny (by Mary Brandolino) Chant this heartfelt poem depicting the plight of an Easter bunny who is recalling his glorious past and resenting about his present. Easter Bunny Hugs and Kisses Go through this Easter poem and get to know how this cute little bunny hopped all the way just to deliver you cute little Easter bunny hugs and kisses as well fulfil your wishes. Easter Bunny Poop Send this cute Easter Bunny Poop poem to your loved ones and tell him/her that because he wasn’t good enough this year, hence he’s entitled to receive this Bunny Poop. Funny Bunny (by Grandpa Tucker) Read this poem which narrates a story of a funny bunny and what gave her fames in this festive season of Easter. Meeting the Easter Bunny (by Rowena Bennett) Read this poem about a Funny Bunny who’s all decked for the festival and all ready to visit every child in every house delivering them colourful Easter eggs. I Saw a Little Bunny Go through this cute and small bunny poem, where the bunny hopped and never stopped! He Loved and Died Read this heartfelt poem depicting the torment that our Lord had to go through and how he continued showering His love. The Crucifixion Read this particular poem telling us why He chose to die to which the obvious answer is due His divine love towards mankind, He resigned!